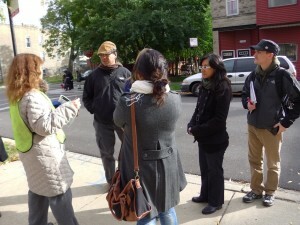 On Wednesday afternoon, October 23, we (two European fellows: Boba Baluchova from Slovakia and Lia Gaudi from Romania as CCH interns) decided to join three Community organizers from “Chicago coalition for the Homeless” (CCH) and leaders from organization “Casa Central – La Posada” in order to help them during school outreach in the area of Humboldt Park. It is one of the neighborhoods in Chicago – widely known for its large Puerto Rican presence. 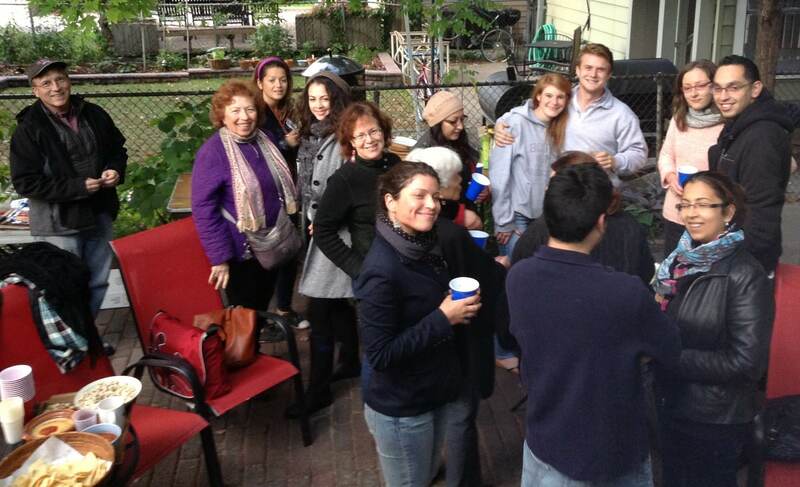 We were divided into groups of two – to be sure that at least one person in group is able to speak Spanish fluently. The goal of this outreach was: contacting adults/parents in front of the Lowell elementary school (while waiting for their children coming out from school) and sharing particular information. We told them about special educational rights and school support (according to U.S. law) for children from families – struggling with housing issues (homeless families, doubled-up families, moving families without regular place to stay etc.). These children should receive free transit cards, fee waivers for uniforms, field trips etc. in order: not to be discriminated or excluded. CCH people, few leaders from Casa Central (mothers and women from this Latino community) and us (volunteers – European fellows) tried to raise awareness about educational rights and encourage people to ask for them. Many adults in front of the Lowell elementary school have known somebody else in neighborhood – experiencing homelessness or “doubled-up” life (sharing the house with another family), but they haven’t known about this possibility – to ask Homeless liaison (particular person in every single school – dealing with housing issues of students) for support for their children. It was very interesting practical activity in the field. 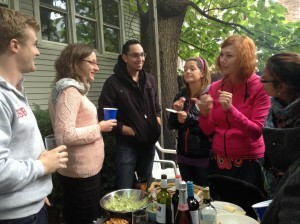 On Saturday, first day of weekend (October 19), European fellows didn’t go to work to their host organizations. 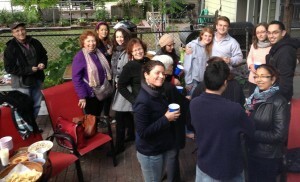 Instead they attended nice BBQ-party at house of Joanna Brown and Josh Hoyt house (Zsofi and Viktoria – Hungarian and Bulgarian fellows’ hosting family). Few weeks ago we already met Josh Hoyt (chief executive strategist at Illinois Coalition for Immigrant and Refugee Rights: http://www.icirr.org/) at training on community organizing in Chicago. So it was nice to meet him and his family again. The European fellows Vladislav Petkov (Bulgaria), Robert Bekefi (Hungary) and Elena Carbunaru (Romania) volunteered in the logistical preparation of a fundraising event – Second Annual Art Auction. 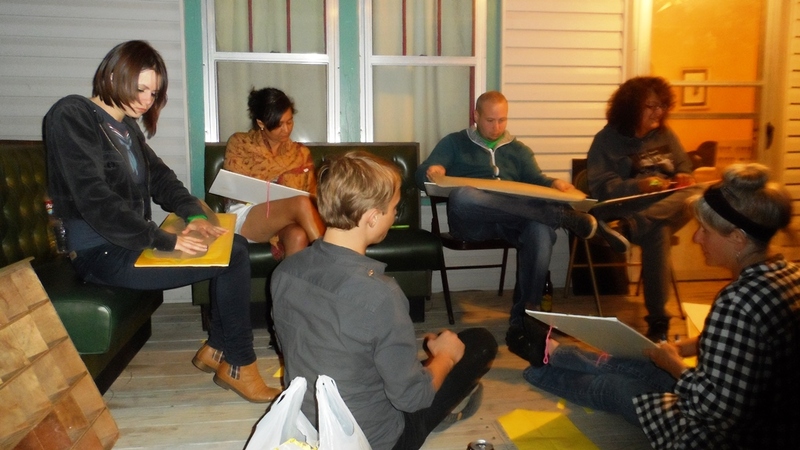 The event was organized in Anna Murdock’s café in Wichita, Kansas by The Seed House (Casa de la Semilla) and took place on October 12th 2013. 77 pieces of art donated by local and external artists were offered to the public on silent and live auction. The European fellows helped with moving furniture, arranging spaces, decoration and other logistical details. Over the past year and a half, housing and social service advocates in Chicago have worked quietly to tackle a controversial issue — easing CHA’s long-standing restrictions on residents with criminal records. 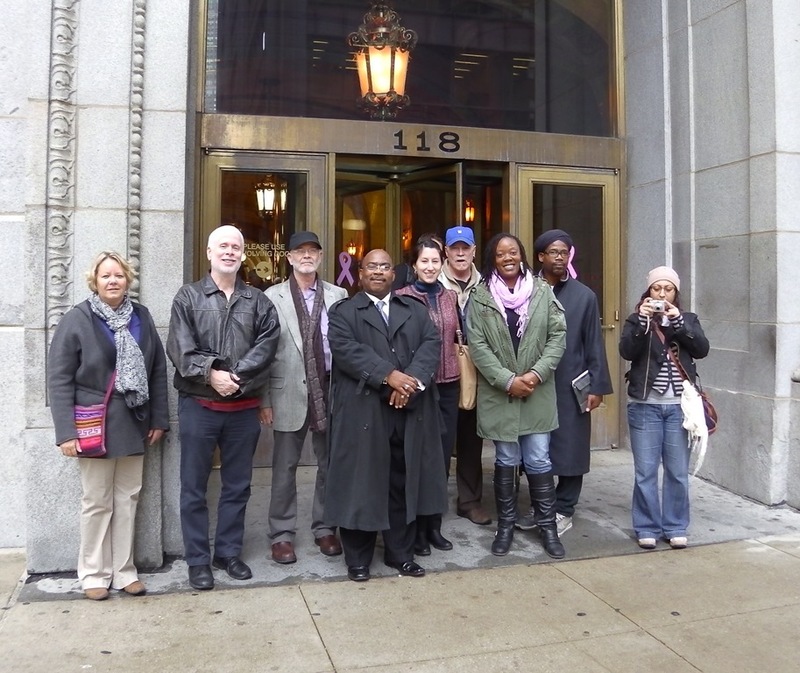 They formed a Re-entry committee, drafted a pilot program and found a sympathetic ear at the very top of the Chicago Housing Authority (CHA) — Charles Woodyard, who just last month committed to keep meeting with them about the idea. On October 17, the members of Chicago Coalition for the Homeless (CCH) decided to take a direct action and visit the Chicago Mayor’s office. 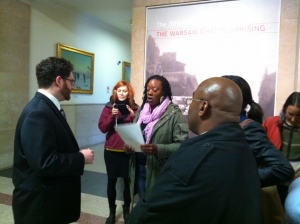 European interns Lia Gaudi and Boba Baluchova joined the group of CCH advocates in order to deliver the letter to Rahm Emanuel’s office — to request a meeting about the proposed CHA Re-entry Pilot Project. It was very interesting direct action. But also the debriefing led by the director of CCH was also very important in order to understand the process of thinking, planning and acting of community organizers. European fellows took photos and recorded the video of whole event. 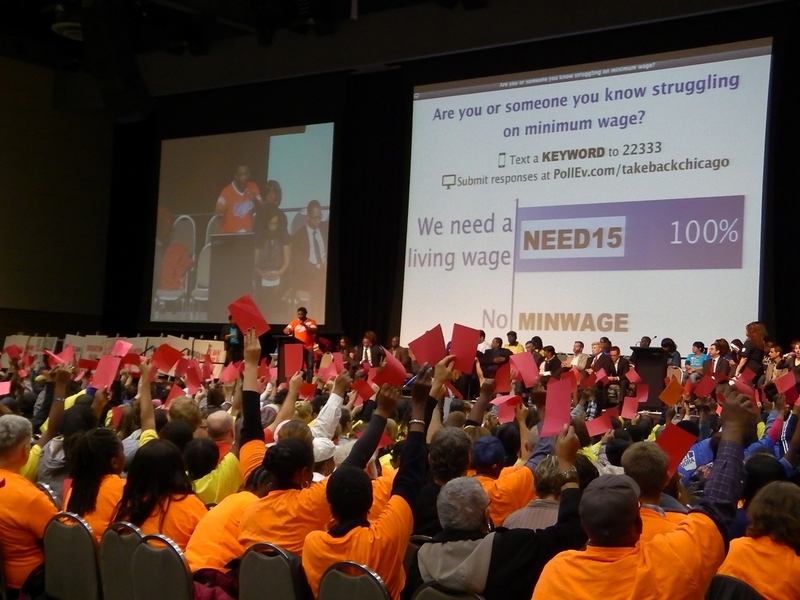 On Tuesday evening European fellows took an action and joined almost 3 000 Chicagoans in the fight to take back the jobs, schools, housing and safety net. 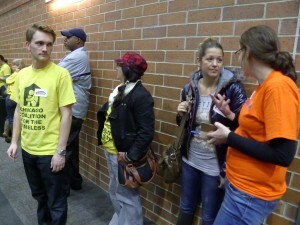 On October 15, Romanian fellow Lia Gaudi and Slovak fellow Boba Baluchova (the newest interns in ‘Chicago Coalition for the Homeless’: CCH) with 150 co-workers, organizers and leaders from CCH attended the event: “Take Back Chicago!” in UIC Forum at 5 pm. The girls were there already at 3 pm and helped the organizers from the core organizations ‘Grassroots collaborative’ & ‘Stand up! Chicago’ to set up the room and distribute printed materials about the event. The fellows Annamaria Kovacs (Hungary) and Laura Stefanut (Romania) joined their friends Lia & Boba and took a lot of photos during the rally. Being present during the preparation of program, planning the agenda and setting up the room is very important for community organizer – to use the power of people, to have a control of event and to push the guest-speakers (politicians on hot chair on the stage) to make right decisions. It was inspiring rally – full of courageous people. Elena Carbunaru (Romania), Robert Bekefi (Hungary) and Vladislav Petkov (Bulgaria), who are doing their internship in Wichita, Kansas, took part in a direct action that took place on October 15th 2013. 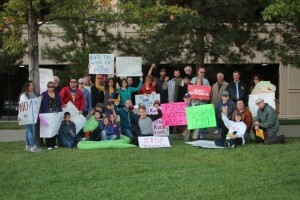 The protest happened during Kansas Policy Institute’s annual dinner in Wichita. KPI is part of American Legislative Exchange Committee (ALEC) and is connected to manipulative researches that feed bad policy and legislation proposals in the sphere of education, healthcare and environment. 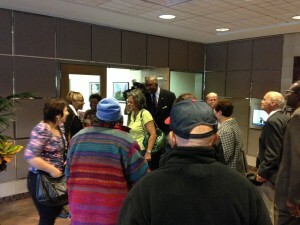 The protest was organized in collaboration between trade unions and community organizations and groups, among which Sunflower Community Action, Wichita. Kalina Hristova (Bulgaria) and Oana Botezan (Romania) with Arkansas Community Organizations were part of the group that visited U.S. Rep. Tim Griffin’s office in Little Rock delivering a letter calling for him to vote to end the government shut down, lift the debt ceiling, end the automatic spending cuts and raise revenue by closing corporate tax loopholes. ACO was coordinator of the meeting. 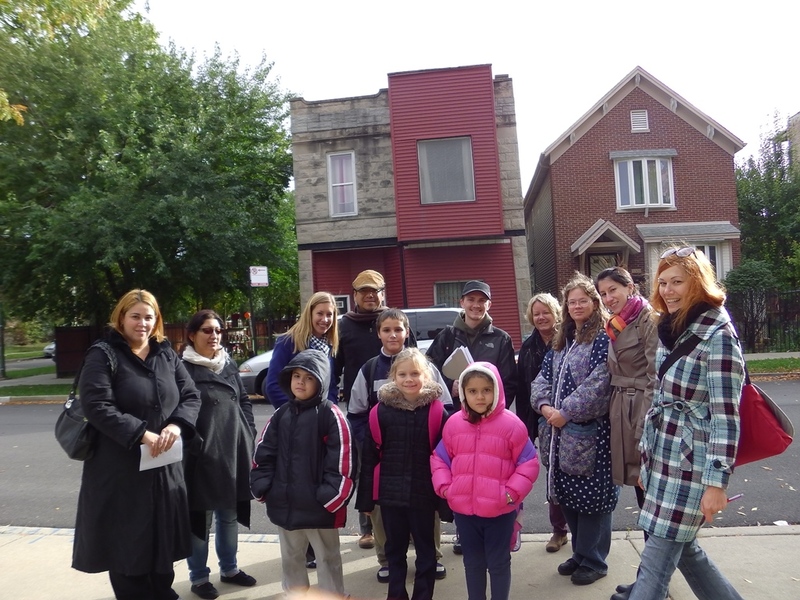 European fellows from Hungary (Zsofi), Bulgaria (Victoria), Slovakia (Boba) and Romania (Laura) did also a bit of volunteering on Saturday (October 12, 2013) in Chicago. Boba and Laura helped their co-fellows Zsofi and Victoria (from the same fellowship program in U.S., coordinated by Great Lakes Consortium for international training and development & thanks to U.S. department financial support) during very interesting march on immigration reform, organized by one of the hosting organization ICIRR. 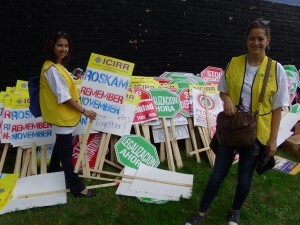 The Illinois Coalition for Immigrant and Refugee Rights is a statewide coalition of more than 130 organizations dedicated to promoting the rights of immigrants and refugees to full and equal participation in the civic, cultural, social, and political life of our diverse society. 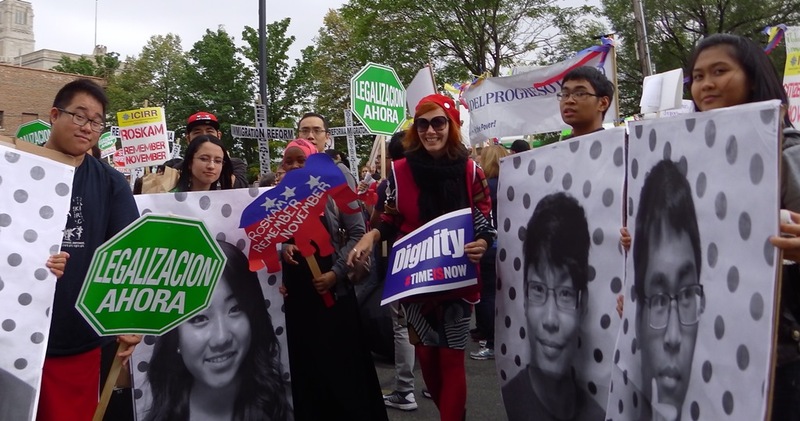 Thousands of immigrant leaders and families and allies from immigrant rights, labor, faith communities marched on October 12th to demand that Congress should pass immigration reform with dignity, justice and respect for all immigrants. The Most Important idea that we’ve learn that day was: How powerful and strong one crowd of thousands of courageous people can be – when it’s well organized (people stand together to achieve their goal – basic human rights). It can have very strong influence on politicians & decision makers!